I’m sorry my posts have been infrequent lately. I’ve been so busy that I haven’t had a lot of time to try out new recipes and put together new posts. But, I had a half day at work today, since we’re coming up on a three day weekend. It’s nice to have a little break, and a chance to do a new post. I was in LA a week ago for work, and while I was there, I tried out a vegan restaurant in Ventura. 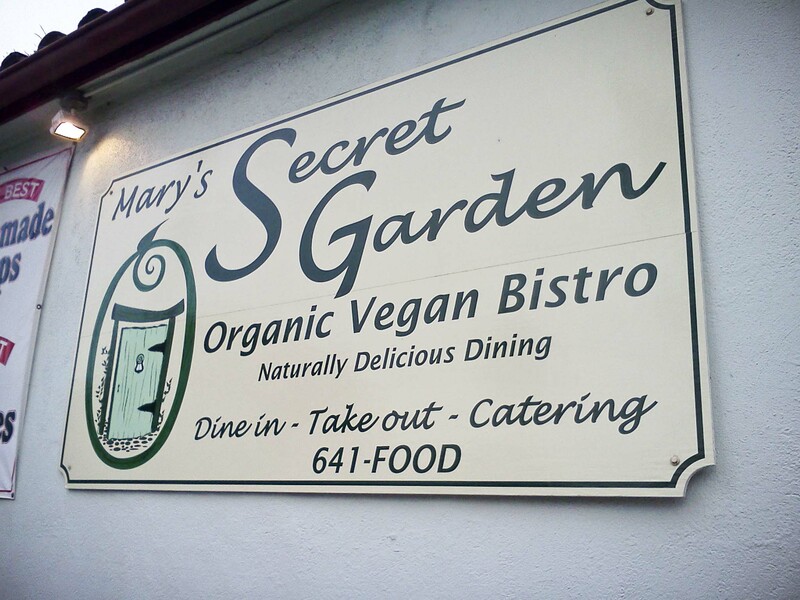 It was called Mary’s Secret Garden. It was a cute little place! It was nice out, so we decided to eat outside. Their specials included a coconut cauliflower soup that had a curry flavor as well. It was really yummy, though I didn’t get a photo. For the main courses we ordered the Syrian Falafel Wrap and the Tofu Pad Thai with a side of grilled pita, and a pot of tea. Everything was really tasty! I would definitely recommend this place if you find yourself in Ventura. Most of the trip I was in Pasadena, which seems to have a lot of vegan/vegan friendly restaurants. Unfortunately I didn’t get photos of the food I ate at other places, but they’re all worth mentioning in case anyone finds themselves in Pasadena. One place I tried was called Tender Greens. They are mostly not vegan, but they have a vegan salad which is actually really yummy. I ended up getting it twice during my trip. 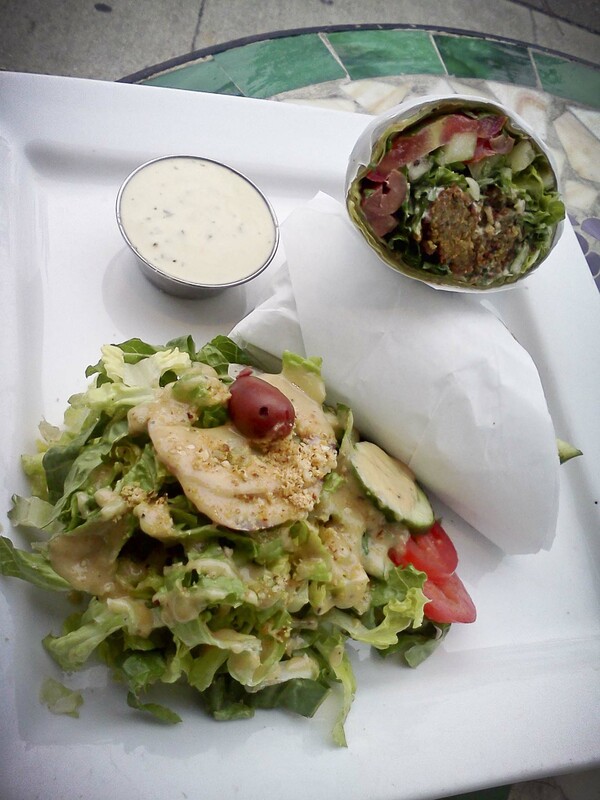 It has farro wheat, cranberry and hazelnut quinoa, cucumber, green hummus tabbouleh, and greens. I like that they put some thought into their vegan salad and took the time to make it yummy. I also tried out the Himalayan Cafe, which also isn’t all vegan, but they have vegan options. They were really friendly there, and the food was really yummy. The chef even came out to ask us how everything was and seemed proud of his food and happy that we were enjoying it. We had vegetable momos, which are like gingery dumplings – very yummy! We also had Aaloo Kauli, which is a cauliflower and pototo dish, and Aaloo Paratha, which is thin bread stuffed with mashed potato and served with a mango chutney. 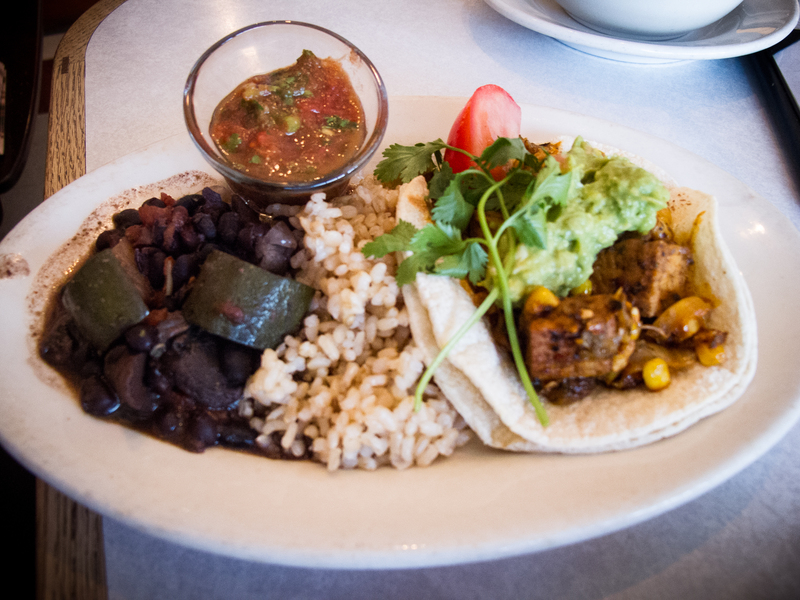 It’s not always easy to find vegan food when you travel, but in Pasadena and California in general, I usually find plenty of yummy food to choose from! On a completely different topic, before I wrap this up, I’d like to make a recommendation to anyone planning a barbeque over Labor Day weekend. If you’re looking for a vegan hot dog that is actually good, try Field Roast Vegan Frankfurters. They are so much better than any other vegan hot dog I’ve ever tried. Other brands are okay, but usually a bit rubbery. These taste much better and have a better texture than any other brand I’ve tried. They’re really good when you saute them in a little olive oil because the outside get’s crispy. They say they can be grilled too, though I haven’t tried it myself. I bet they would be really good right off the grill though! Hope everyone enjoys their holiday weekend! It’s been a while since I posted last…busy week! But I have more to share from my trip to California a couple weeks ago. 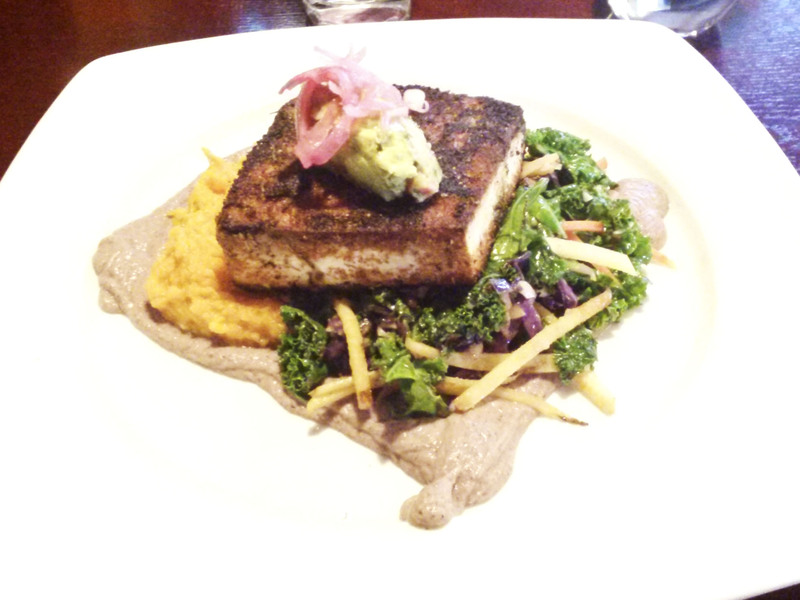 I ended up taking a day trip to Pasadena for work, so I decided to check out a vegan restaurant while I was there. Pasadena seems to have a decent number of vegan options. This one was called Green Earth Vegan. 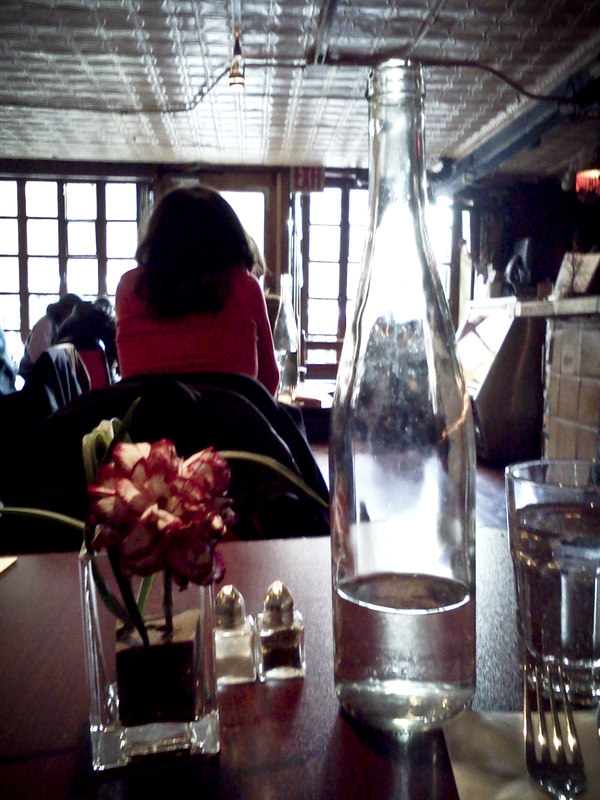 It was a cute place with a nice ambiance, and the food was good. I had a really hard time choosing what to order, so I asked the waitress what her favorite thing on the menu was. She said the Classic Burger so I choose that to end my indecisiveness. 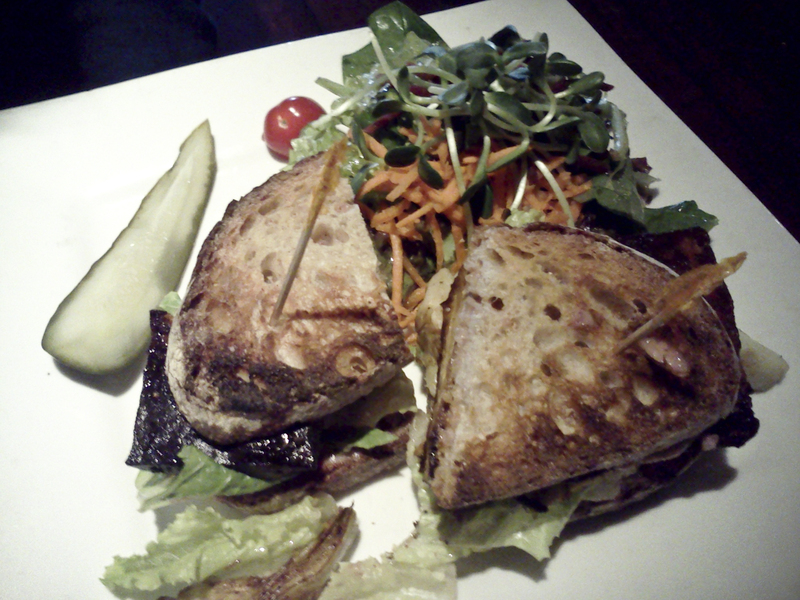 I normally wouldn’t order a veggie burger at a vegan restaurant, but since it came with a recommendation I went for it. It was actually pretty good! I didn’t get a photo though…guess I was too hungry! 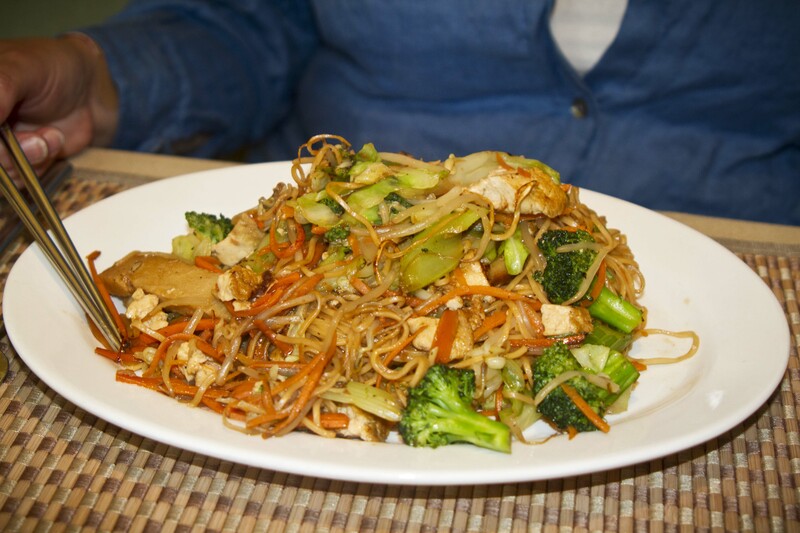 I did get photos of the other things we ordered though… Spring Rolls, Chow Mein and Crispy Chow Mein. Overall, I liked this place and I would go back if I found myself in Pasadena again. 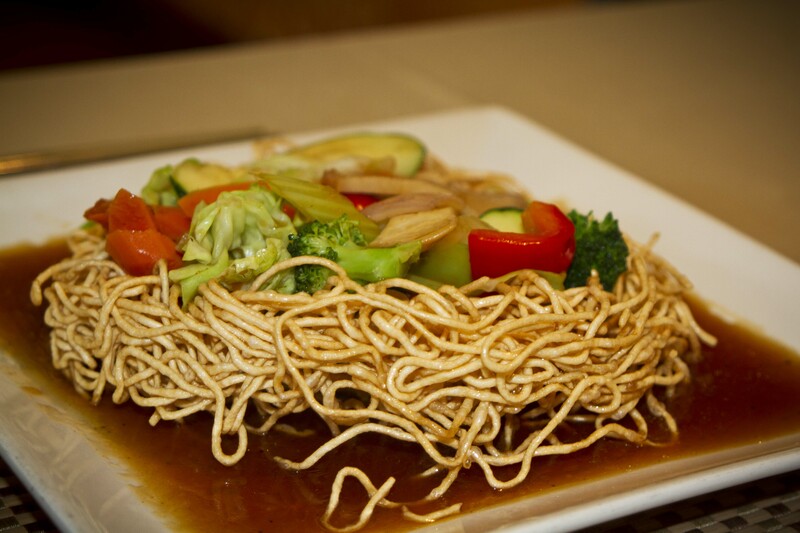 They have an eclectic menu and a lot of other dishes that look pretty yummy. 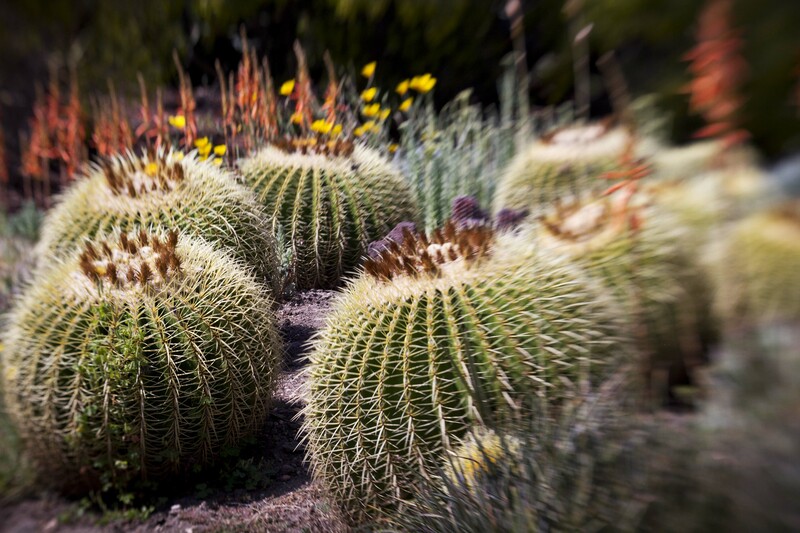 While we were in Pasadena, we also took a trip to the Huntington Botanical Gardens. 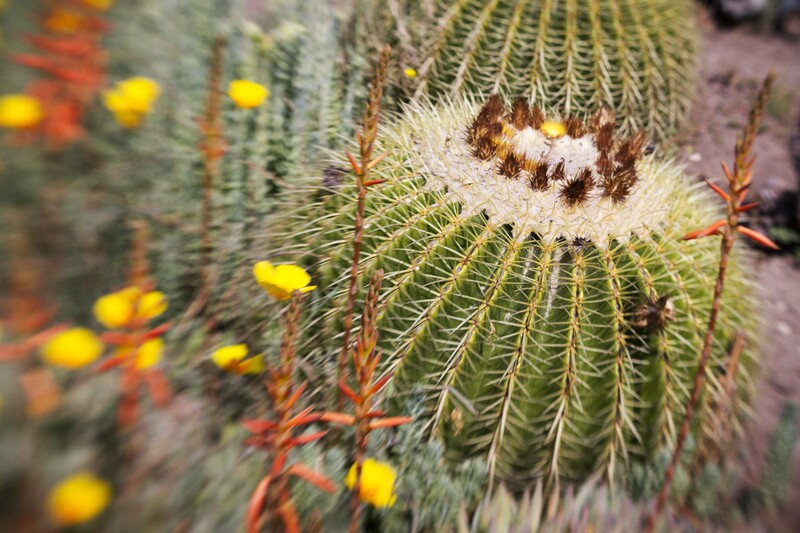 We only had a couple hours there, so we focused on the Japanese Garden and the Cactus/Desert Garden. 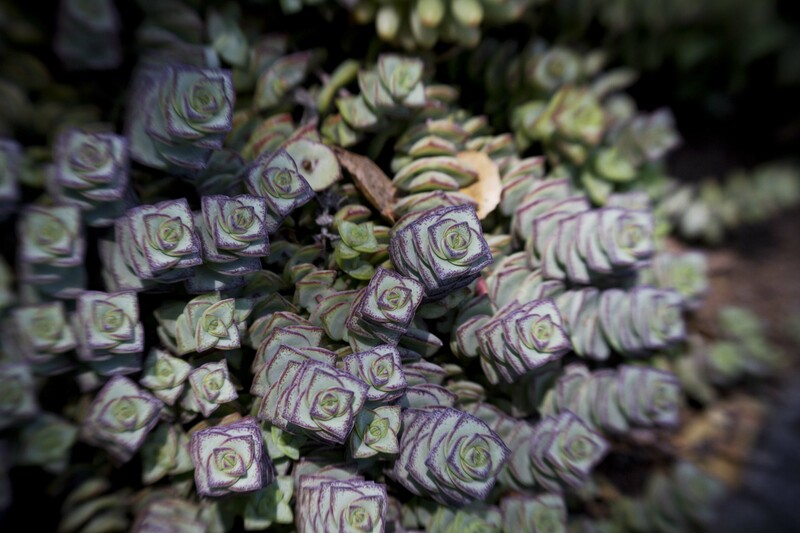 It was a good excuse to try out my new Lens Baby. They also have a variety of other gardens such as Australian, Chinese, Herb, Jungle, Shakespeare, etc. It’s a pretty big place! I would like to go back someday and explore some of the other gardens that I missed. 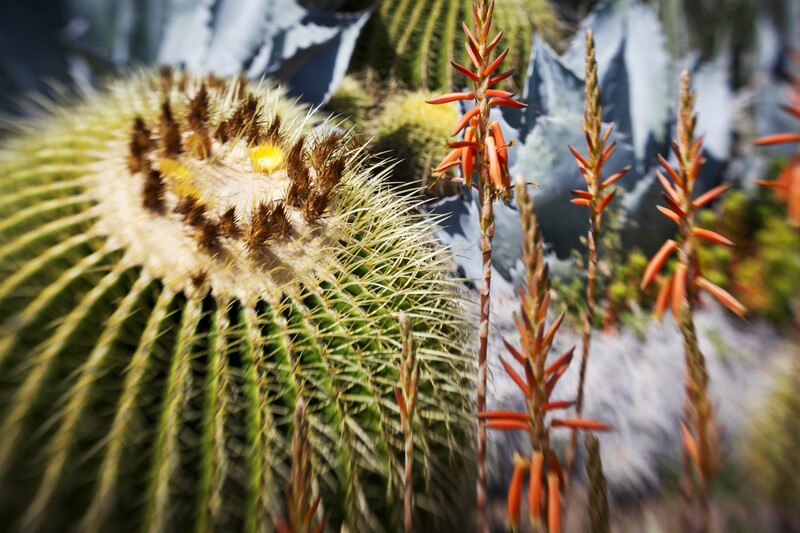 The Desert Garden fed my growing obsession with succulents and cacti. 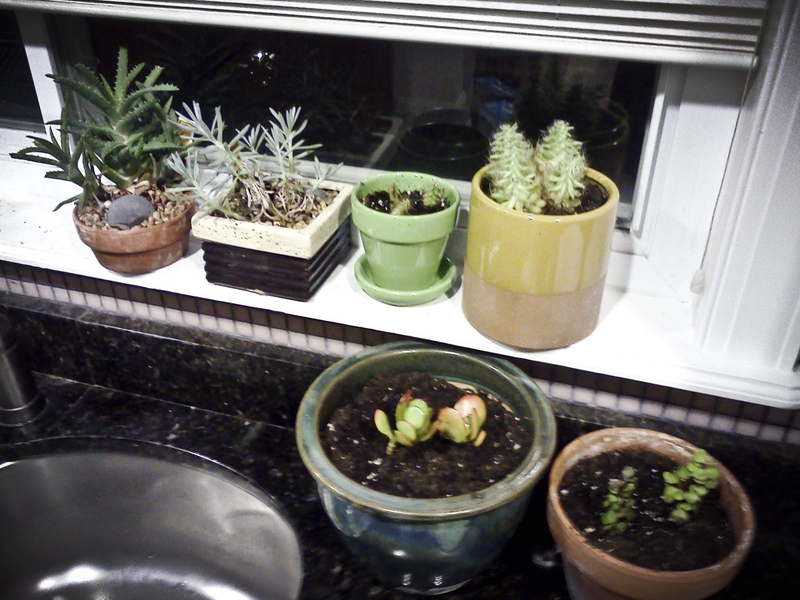 I’m slowly gathering a small collection on my kitchen windowsill. They’re just so cute and the only plant I can seem to keep alive! The two little pots with jade plants are cuttings from my sister’s backyard. 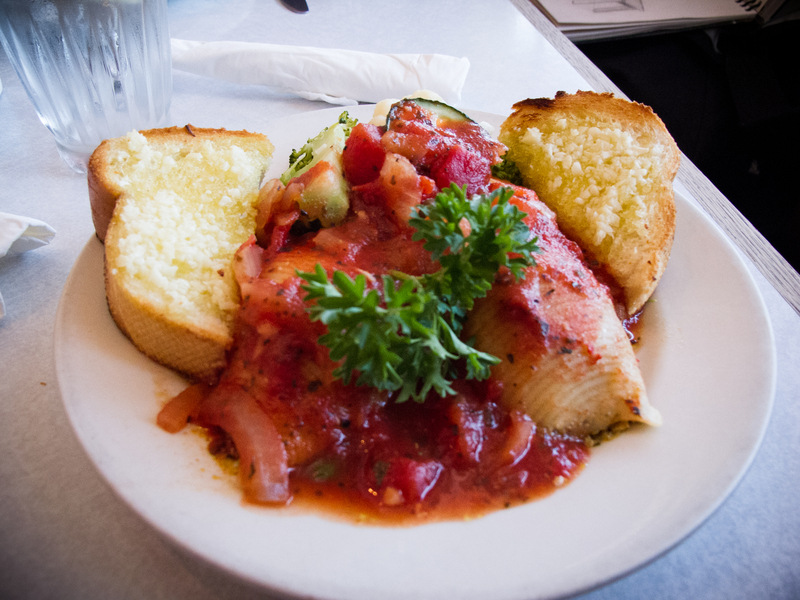 One of the restaurants I like in Santa Barbara is Sojourner Cafe, which is downtown on Canon Perdido off of State Street. They have vegan and non-vegan food. Everything is labeled if it’s vegan or gluten free, which makes it a good choice if you’re going out with a group that has different food restrictions. We tried the Vegan Jumbo Pasta Shells, Split Pea Soup, Cornbread Muffin, and Chili Tempeh Tacos. I’ve had the stuffed shells before, and it’s where I got the idea to try a vegan version of my own. The garlic bread that came with it was also quite tasty. 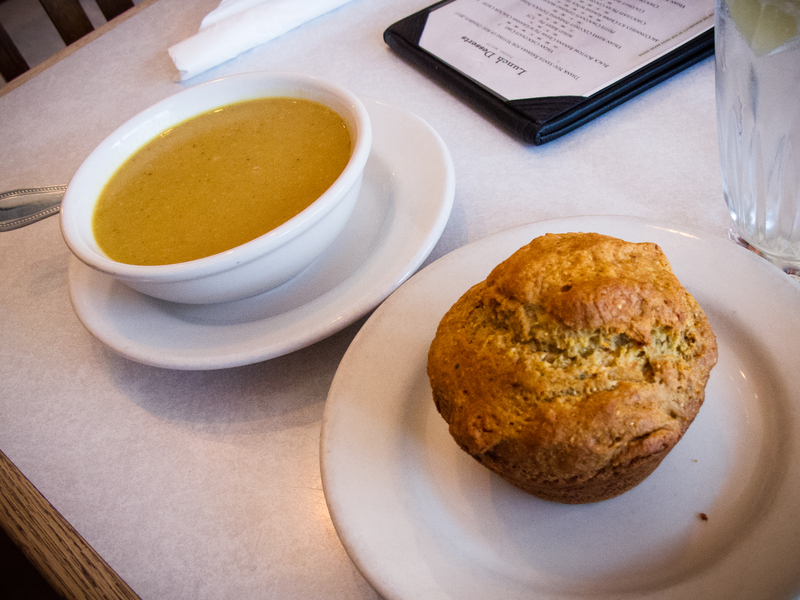 The split pea soup was also good, and I’d like to try out a recipe at home. Does anyone have a good vegan split pea soup recipe? 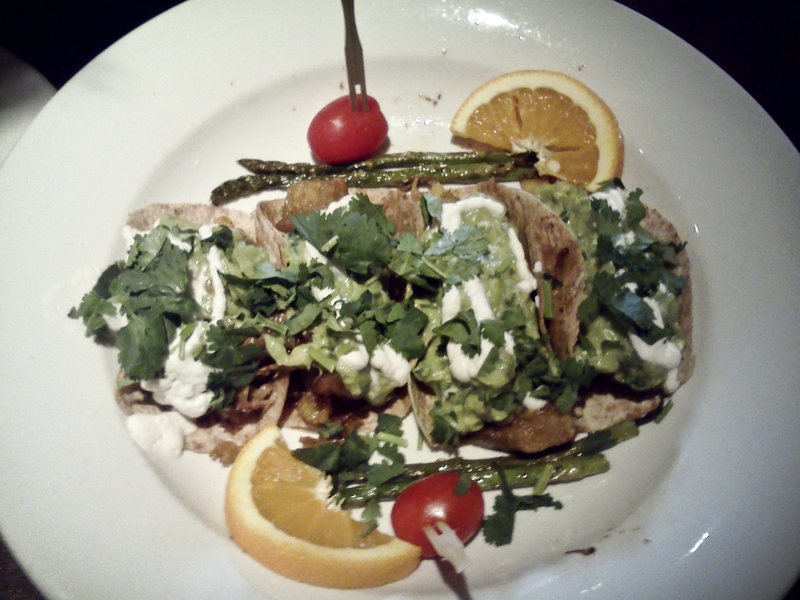 The chili tempeh tacos were on the spicy side, but yummy. The cornbread helped cool down the spice. 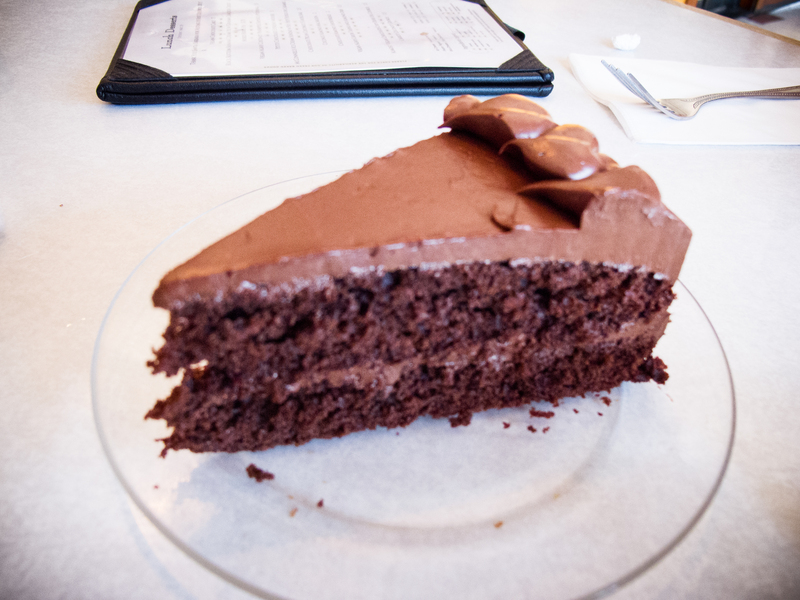 We couldn’t leave without trying out the vegan chocolate cake. Sometimes icing on cakes in stores and restaurants isn’t very good, but this icing was pretty yummy…almost like a light chocolate mousse. Yum! 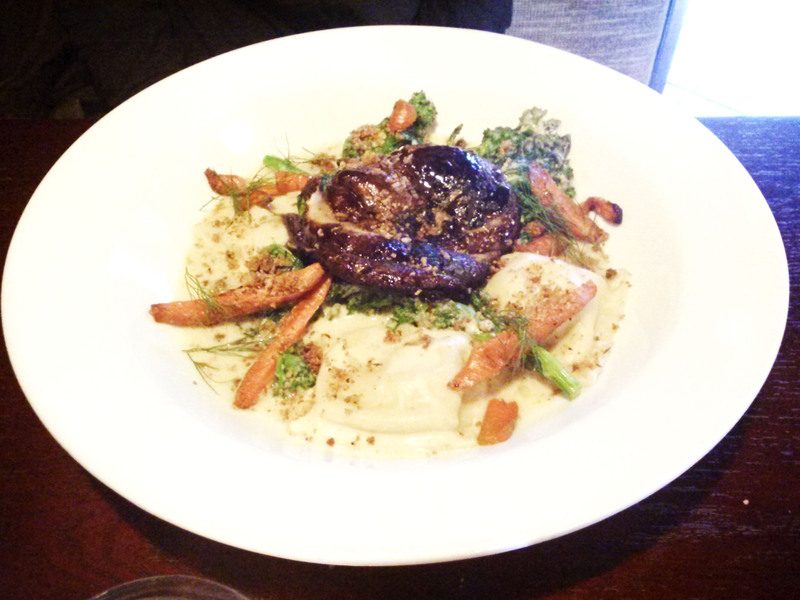 If you find yourself hungry in Santa Barbara, Sojourner’s is definitely a good choice. They also have started composting, and they purchase produce from local growers, so you can can feel good about your yummy meal! This month is shaping up to be quite busy, so I may be continuing on this one-post-per-week pace I seem to have gotten into. I chalk it up to having too many hobbies and too much to do! 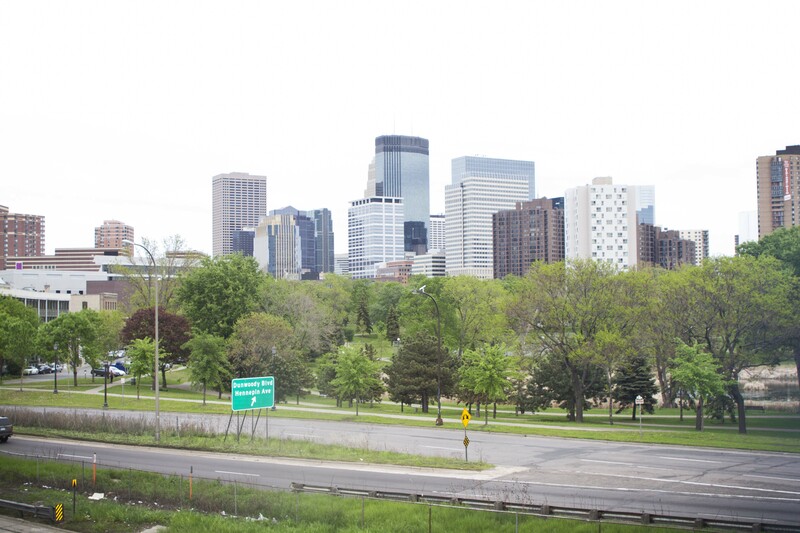 This past weekend I spent in Minneapolis, Minnesota. It was my first time in Minnesota, and really my first time in the mid-west, besides a trip to Ohio years ago. 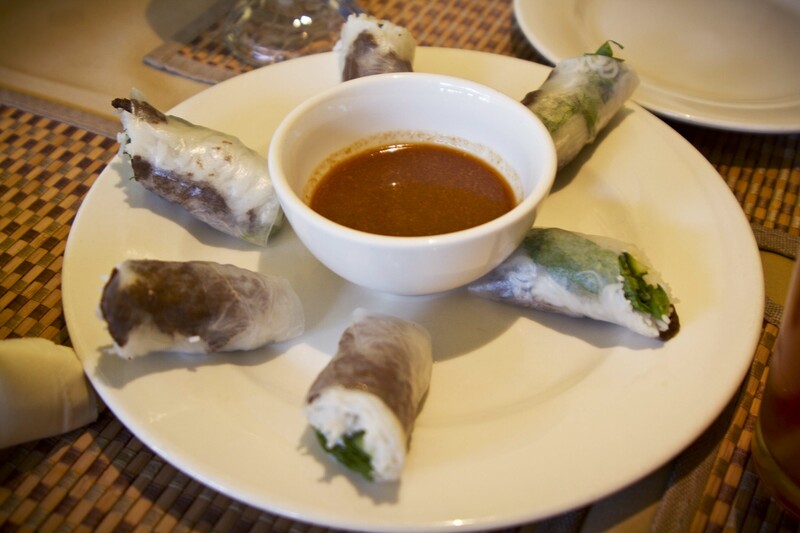 Whenever I travel I like to find a local vegan or vegetarian restaurant to try out. 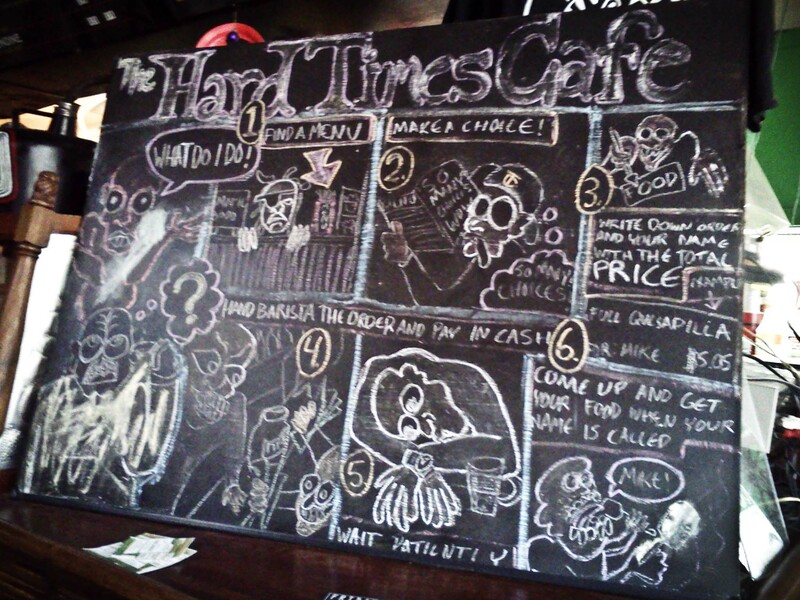 I wasn’t expecting tons of options in Minneapolis, but after a search on Happy Cow I found the Hard Times Cafe. 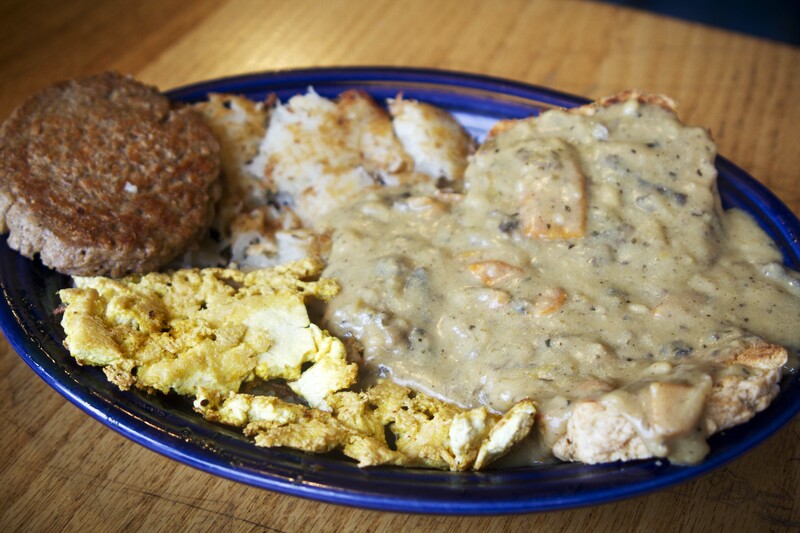 The description on Happy Cow boasted vegan breakfast with pancakes, tofu scramble, seitan, and more. That definitely piqued my interest! After reading the reviews however, I was a bit wary. Reviewers warned about the dive bar/unkempt feel of the place, gross bathrooms, and disgruntled service, but mostly claimed that the food was good. After a bit of debating, my rumbling stomach and I decided to give it a try anyway. I can’t say I wasn’t forewarned of what I was getting into. 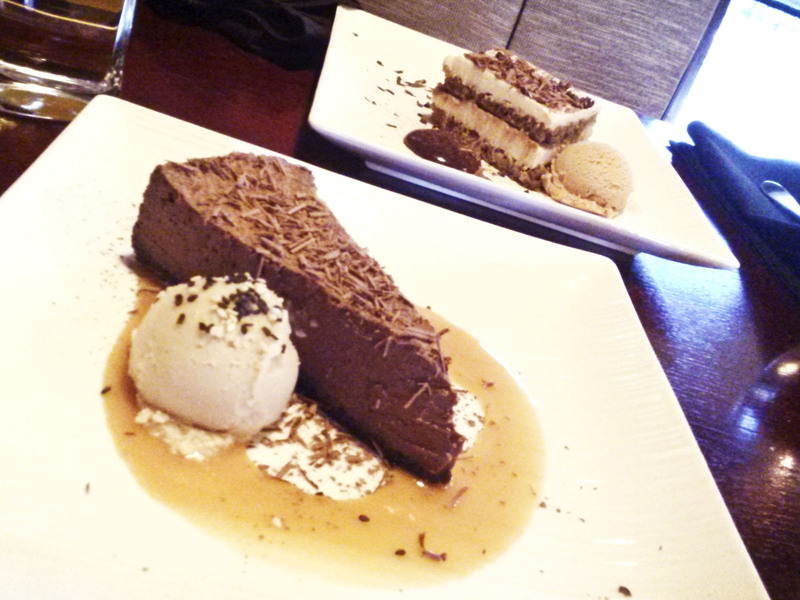 Let me preface this by saying that I really try to find the positives about a restaurant when I’m blogging about it. In general, I like to be supportive of any restaurant that is offering vegan options because I think it’s great that they exist. But this place was unlike any restaurant I’ve ever been to. Let’s start at the beginning. The road in front of the restaurant was completely torn up, so it had the feel of a run down construction site from the beginning. You walk in and there’s no menu posted on the wall. 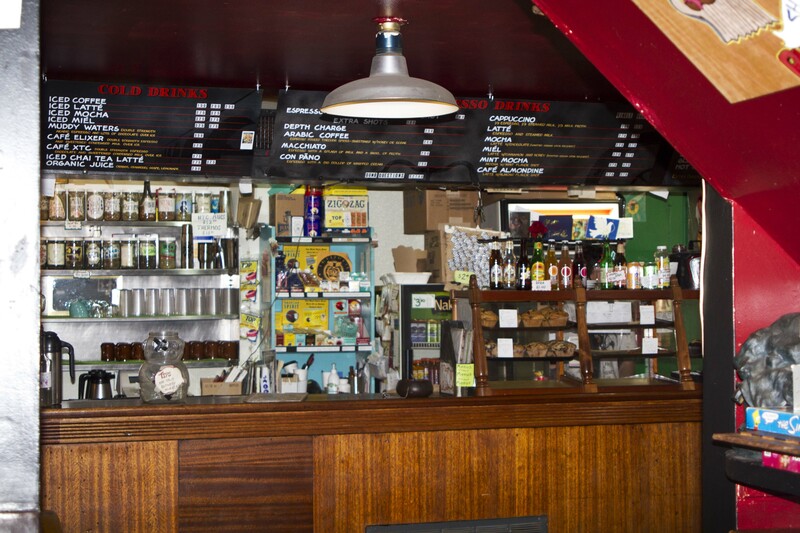 There’s just a big chalk board full of instructions about how to order your food. You have to find a menu, choose what you want, write it down on a slip of paper along with the price, and slide your slip of paper over to the cashier. The cashier wasn’t overly friendly, but not rude either. I placed my order and took a seat in a torn up booth. This place fit the description of being a dive pretty completely. It was about 10am, and the music of choice was death metal… a little much for me before my morning caffeine. The way that they alert you to your order being ready is to have the rather disgruntled chef scream loudly, “HEY! (PERSON’S NAME)!” It was quite alarming the first time it happened, but by the time my order was ready I had gotten quite used to it. So I heard a “HEY! KATHRYN!” and I wandered up to pick up our food. 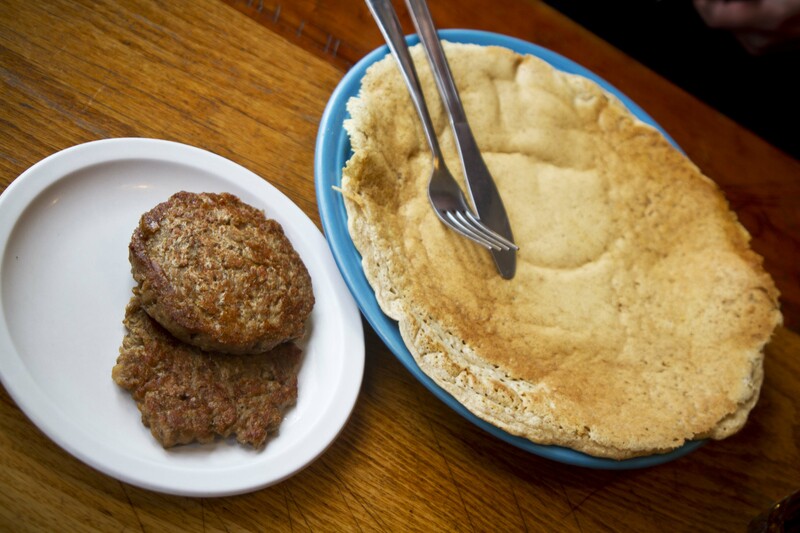 What we got was one giant pancake, two sausage patties, and a plate full of hash browns, tofu scramble, and biscuits and gravy. It looked good, but as soon as I tasted it, the predominant flavor was grease. There was really no seasoning, and it was so heavy I couldn’t eat much of it. The tea we ordered had the taste of cigarette butts. I don’t want to know why. I was really disappointed because the food was the one upside people talked about in the Happy Cow reviews. We ate less than half the food before we gave up on it. I tried to take a photo of their front ordering area, and the chef screamed at me from the back that I couldn’t take any photos. I’ve taken photos at many restaurants and have never had anyone say anything to me, nevermind scream at me from across the restaurant. A polite or at least quieter, “We don’t allow photography,” would have sufficed. So, although I try to find the positives about the vegan restaurants I visit, I can’t say that I could find any positives about this place. Oh wait! It was incredibly cheap, so there you go. It did provide me with a unique experience and a story to tell, so I don’t regret checking it out. Would I ever go back? No, no I wouldn’t. But chances are I won’t find myself in Minneapolis again anytime soon anyway. 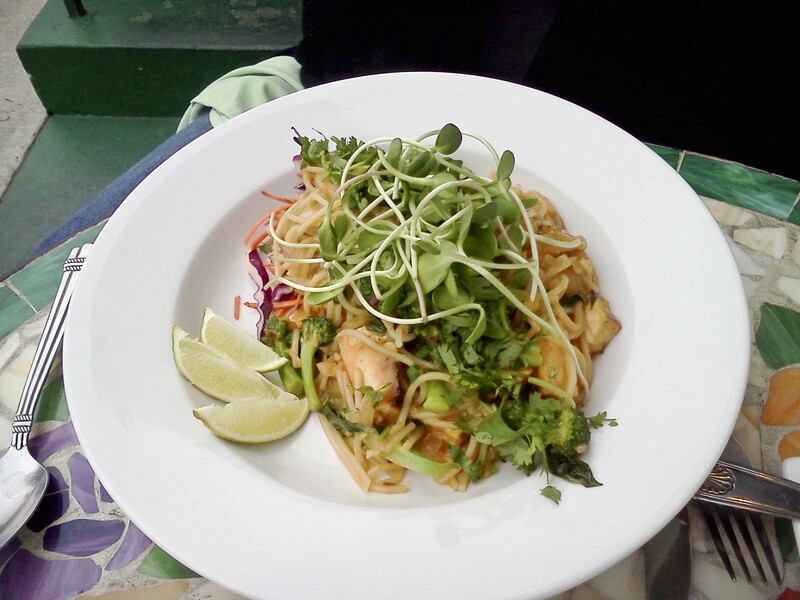 The rest of the trip was quite nice though, and I did manage to find plenty of vegan food at stores nearby. 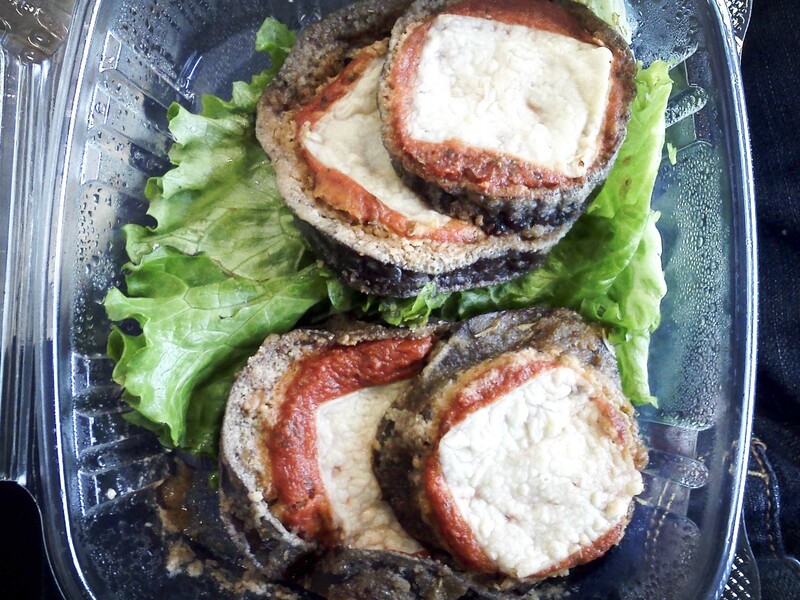 The Minneapolis airport even surprisingly had vegan eggplant parmesan. 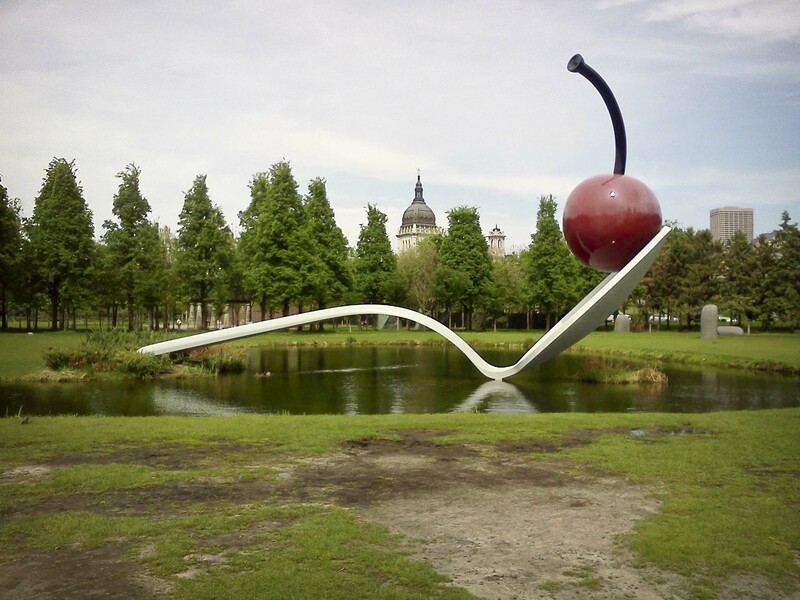 I saw the giant spoon bridge in the sculpture garden, and I went to the Mill City Museum. This museum charts the history of flour mills in Minneapolis – the Gold Medal brand and then later General Mills. In general, people in Minneapolis were quite friendly, but sadly, the Minneapolis vegans were the least friendly bunch, at least the few that I encountered. 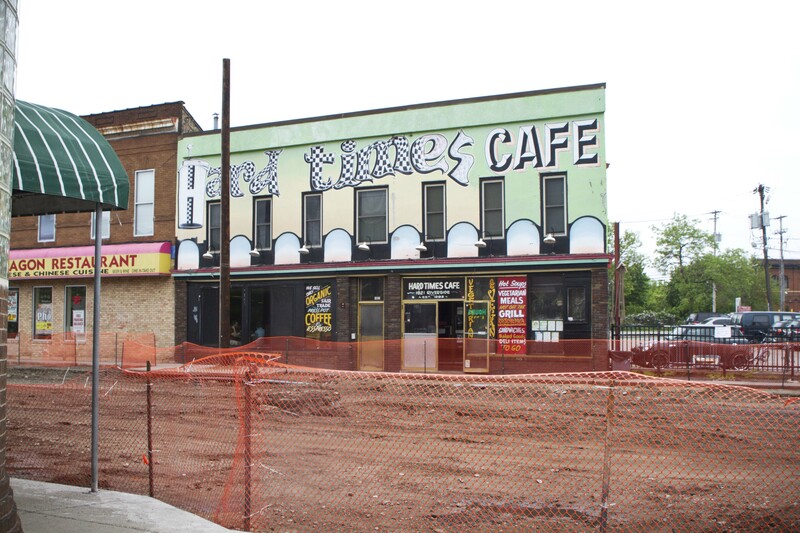 If I’d had more time, I would have liked to explore some of the other vegan options in Minneapolis… like the Triple Rock Social Club a few blocks over from Hard Times. They also have vegan pancakes and tofu scramble, and maybe a better atmosphere. Maybe next time! A little while back I had a nice (and very vegan) day in NYC, and I wanted to share a few of the places I visited. They’re all in the same neighborhood and would make a nice day out if you find yourself in NYC needing something to do. I often plan outings based on where there are vegan restaurants I want to try. This particular day started with a stop for bagels with tofu cream cheese at Russ & Daughters, which I’ve mentioned in previous posts. This is a tiny little shop with a lot of character. It was packed when we went in, so I thought it would take a while for us to get our bagels. They were so quick we were in and out in only a couple minutes. The bagels were really yummy too! Definitely a good way to start the day. We then went to the Tenement Museum, not vegan, but very interesting! They have tenements that are still set up how they were in the late 1800’s and early 1900’s when there was a big influx of immigrants to NYC. They have various tours, and the one we went on focused on the start of the textile industry in the area. I would definitely recommend a visit to this museum if you’re interested in the history of NYC or American immigrants. After the museum, we made a stop at Moo Shoes, which is a vegan shoe store right down the street from the museum. I didn’t end up buying any shoes, but it was nice to be able to browse and not have to worry about avoiding leather and suede. 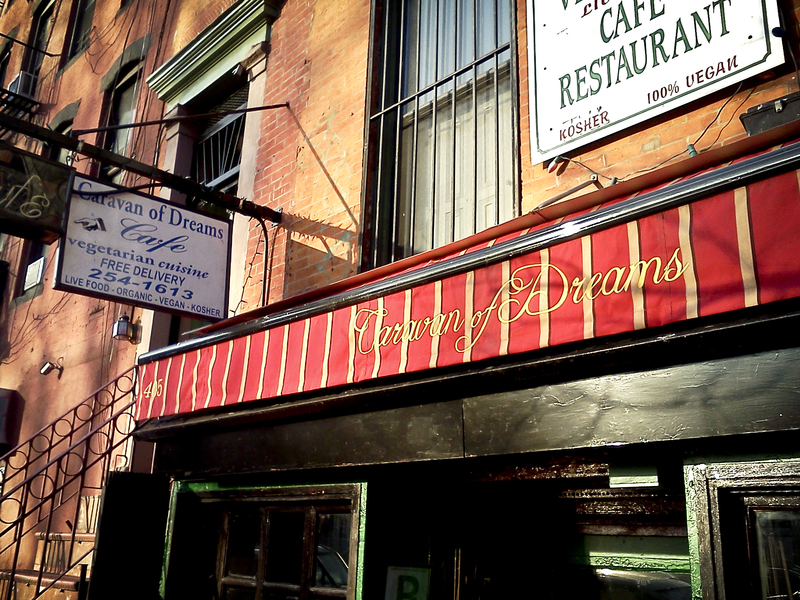 After checking out a few more shops in the area we were hungry again, so we headed over to Caravan of Dreams, which was only a few blocks away. 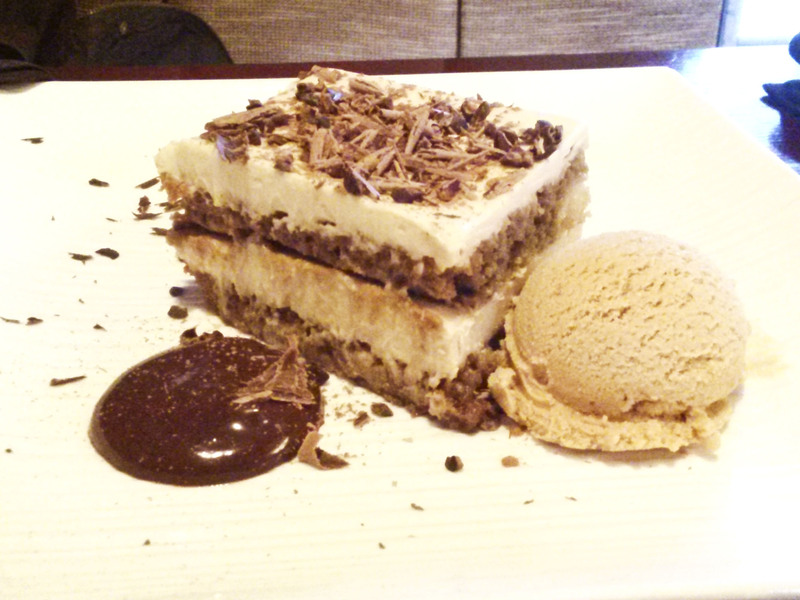 This place has a low key, relaxed atmosphere and the food was really tasty. We tried the Seitan Taquitos and the Applewood Smoked Tofu Sandwich. Both were really yummy and I would get them again. They have a lot of raw options on their menu as well. I definitely want to go back sometime! Unfortunately I only had my phone for pictures, so sorry about the low quality. After dinner, we went to Lula’s Sweet Apothecary, a tiny little vegan ice cream shop. They have vegan ice cream cones, sundaes, rootbear floats, shakes, etc. Our ice cream looked so good, we didn’t even stop to take pictures! It was the perfect way to end a day out in New York. This is a recipe I promised ages ago in my post about Blackbird Pizzeria in Philadelphia, but I didn’t get around to making it until now. Blackbird Pizzeria’s Chickpea Salad is really tasty, so I had to try replicating it at home. Oftentimes, vegans refer to Chickpea Salad as Vegan Tuna Salad, or Chickpea “Tuna” Salad. It does taste surprisingly like tuna salad, so if you’re missing that, this is a great substitute. Even if you aren’t vegan, I would recommend this as another yummy alternative for lunch. If you’re ever in Philly, be sure to make a stop at Blackbird Pizzeria. It’s one of my favorite vegan restaurants and I go there pretty much every time I find myself in Philly. Drain and rinse the chickpeas. Place them in a mixing bowl and mash them well. There can be small chunks, it doesn’t have to be as creamy as hummus. Add mayonnaise and sweet relish to the mashed chickpeas and stir well. Chop the leaves of two sprigs of fresh dill. Finely chop the onion, celery, and artichoke hearts. Stir into the chickpea mixture. Add garlic powder, black pepper, dried oregano, dried basil, and salt to taste and stir well. Spread the Chickpea Salad on your favorite bread or a roll. Add lettuce and tomato and enjoy!